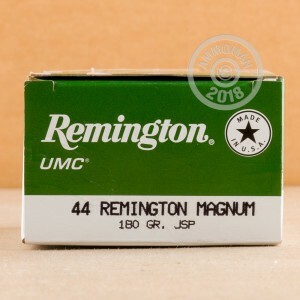 With this 500 round case of .44 Remington Magnum ammo, you won't have to remember if you fired five shots or six. Ideal for use in the Ruger Redhawk, Marlin 1894, and of course the S&W Model 29, these rounds use a 180 grain full metal jacket bullet, non-corrosive Boxer primers, and reloadable brass cases. 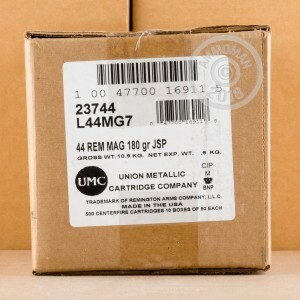 This ammo is manufactured in Arkansas by UMC, Remington's range ammo brand for high volume shooters. The .44 Magnum is a revolver cartridge that has also been adapted for use in rifles and carbines. First loaded in 1955, it gained a huge popularity boost in the 1970s due to its prominence in the "Dirty Harry" films starring Clint Eastwood. In real life, it is more commonly used to hunt even bigger game than criminals, performing well against animals as big as elk. 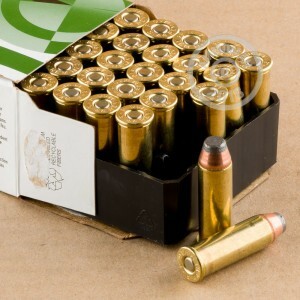 Buy over $99 worth of ammo from AmmoMan.com and get free shipping. When we say free, we mean free--you pay the list price, with no added handling charges. Good price and the ammo works great in my ruger m77/44 carbine. Smith 29 was a handful with these rounds. A good thing. Ammoman's total price on this ammo is about as good as it gets. This 44 Magnum ammo is very powerful. Only some few specialty cartridges are more so (Buffalo Bore, etc.) and some of them can only be used in certain guns. I shoot for fun and firing this ammo rapid DA with my Ruger Alaskan is just plain fun - lots of muzzle flash and bang. If you shoot this ammo indoors you will attract attention. This L44MG7 ammo is my very favorite and is the "Middle Power" ammo I use. For "High power" I use Buffalo Bore 340 grain +P+, Hard Cast. Looking forward to chronographing all this stuff soon. Have been very pleased with the ammo and the way ammoman has done me.